My job as a fisheries enforcement officer (commonly known as a Water Bailiff) is never dull – there is always something going on in the world of fisheries that needs our attention! Many people confuse us with angling club Bailiffs (who are also commonly referred to by some as Water Bailiff’s). However, as fully-warranted fisheries enforcement officers, we have a range of powers available to us, including those for entry onto land, search, seizure and even arrest where necessary - whereas club Bailiffs do not. Part of my job involves checking that anglers have the appropriate fishing licence – protecting the funding which is reinvested into improving fish stocks and the fisheries they support for all to enjoy. These funds are vital for encouraging new anglers into the sport, improving fish habitats, re-stocking following pollution and preventing the spread of non-native species to name a few. All of the money generated from fishing licence sales is reinvested back into angling. Some people think we just check fishing licences, but in fact our role is about so much more. Fisheries law is largely about preventing illegal fishing and making sure legitimate anglers fish sustainably. But regulations also improve fish passage, prevent the spread of non-native species and fish disease, and avoid risks to other wildlife. It is my responsibility to ensure all these regulations are complied with and to take action where they are not. One day I could be on the bank speaking to anglers and checking fishing licences, the next I could be on a night patrol using thermal imaging and night vision equipment to catch criminals illegally netting fish on one of our local rivers. We use 4x4 vehicles and boats to access remote areas where criminals think their activities will go unnoticed – there is nowhere to hide! I work closely with the Angling Trust Fisheries Enforcement Support Service and Voluntary Bailiff Service. We now have almost 500 volunteer bailiffs across the England, each able to provide valuable information on illegal fishing and other incidents to help us do our job. We and the Angling Trust have just ended our annual campaign to ensure compliance with the coarse fishing close season. This allows fish to reproduce without the pressures of angling, helping to support sustainable fish populations for the future. During the 15 March to 15 June closure, these Angling Trust volunteers were able to conduct 2149 patrols and reported 111 incidents to us and the police. Recently, our team and I have spent a lot of time and effort building partnerships with our Police colleagues and training their officers to understand and deal with fisheries crime. This gives them an understanding of fisheries and environmental crime, allowing them to engage in collaborative operations to target fish crime, work with us to undertake joint patrols as well as independently responding to fisheries crimes. The Angling Trust has also worked with Police call-handlers, so that calls about fish theft receive an appropriate and effective response. 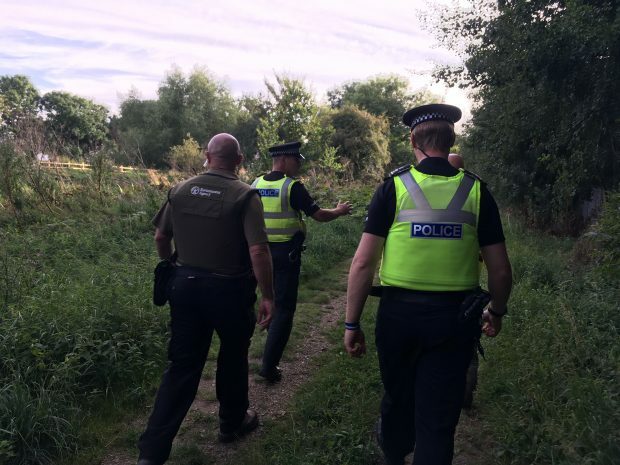 We regularly undertake high visibility patrols with the Police and volunteer bailiffs, reassuring legal anglers that we take their concerns seriously and catching those who choose to flout the rules. Crime is often linked in unexpected ways – we have had some great results whilst working with the Police on fisheries patrols, including the seizure of vehicles for non-fisheries offences such as no insurance, people in possession of illegal drugs and identifying individuals wanted by the Police for serious crimes. While out on patrol I often get told by members of the public of potential illegal fishing that has not been reported to us. We rely on calls from anglers and others to highlight areas of concern, focusing our activities on areas we know are a problem for legal anglers. I would encourage everyone to help us tackle illegal fishing and environmental crime by ringing our Incident Hotline on 0800 80 70 60 – you can do this anonymously, or alternatively you can contact Crimestoppers on 0800 555 111. I would also encourage people to try fishing – it’s a great sport and can be very relaxing and is a great way to escape the general stresses of modern life. You can also see some great wildlife and meet like-minded people; the angling community are very supportive of each other and very forthcoming with hints and tips for successful fishing. For further information on the rules for angling, please visit our .gov website. Local rivers very scarce of fish. Farm slurry usage is being questioned. I like trout fishing, whenever i go to a day water the bailiff will do his rounds and I pay for my ticket. If the EA are concerned about unlicensed fishing, why don't you simply ask the bailiff to refuse to sell me a day ticket until i show him a current fishing license? No doubt you have already thought of this, it seems so obvious to me that i can't think why you wouldn't have.... so, what bit of information am i missing? It's a power thing, the plod and the EA like to be the only ones allowed to check a rod licence. I think you need to consider the impact otters and cormorants are having on waters rented by angling clubs. The increase in otter population, appears to be artificially supported by angling clubs who's water are predated and cannot take protective measures such as fencing, due to lease restrictions or costs. Wootton Bassett angling club lose large carp annually predated by otter or otters. Hey guys sounds like great work going on, I am currently working as a local government environmental enforcement officer, would love to get involved with you guys as also a keen angler, any jobs around the Kent area at the moment? I fished at Whitmore Fisheries, Lamcashire last week, really good to see water bailiffs appear and begin checking the anglers. There are plenty of people without a licence so big thumbs up, good to see! It's great to hear that your doing this necessary work,but a lot of venues that have the closed season don't get visited enough by enforcement officers,unless members of the general public report that there is a problem. I know that you all do a great deal of fantastic work behind the scenes that people don't see, perhaps resulting in that work going unappreciated. I'll say one thing, your quote in the opening of the article was somewhat belittling to 'club bailiffs' many of whom are volunteers and work very hard all year round, and also have more powers than your own volunteer bailiffs, (whom you don't belittle, as they aren't contained within the cheap shot about 'club bailiffs'). Your volunteers can't tell an angler to pack up and leave. They can't even approach an angler and ask for their permits ! So don't knock the club bailiffs, work with them. Actually, why was this distinction that you make, even necessary ? In Wales every ditch, stream river are is being polluted from source to sea. The breeding grounds are being destroyed by farm slurry running off the fields. If the breeding grounds are destroyed then there is no hope, no matter how much research is done out at sea. Need to reverse the efforts made. Start at the head waters where fish breed and work down. Clean water is what is needed. Fencing off river banks is just a p.r stunt, seen to be doing something, where a picture can be taken and put in the press and keep people quiet. Well it doesn't convince me! Slurry is a liquid, and full of chemicals,such as hyperchloric acid,iodene and usually a product called "slurry bugs" which contains amongst other chemicals, flowing agents To be pouring it onto the land, which in Wales is steep, suffers from heavy rainfall and in the volume it does, then there absolutely no hope of clean water. Farmyard Manure is a solid, holds its structure well, does not run off the land and slowly releases the nutrients in a controlled manner, and should not contain chemicals. It's the only way to achieve clean water in the rural parts of Wales. Its such good work you do for the fish habitat and fish protection . Its a shame to say there's not many ea bailiffs that cover the whole of wales . 3 bailiffs . No wonder some rivers have been hammered by the poachers . I'm only a club bailiff or river keeper is the technical term . Who can only move people on and that's it . Bet you wish you had never started this blog. Your average angler comes over as an ill informed, miserable, Daily Mail reader.